I love nothing more than to see a new and innovative shaving brand going head-on-collision against the supremacy of the leading big guns of the shaving market, and it seems that's what Raz*War are currently on a mission to do. If you're up for a fight, then that's half the job done already! The big question is, does Raz*War offer a credible challenge to the market leaders, or are we just looking at yet another shaving range trying to make it big on the grooming scene? I decided to delve deep into the Raz*War collection, picking out a few gems that simply blew me away. Here's my pick of the bunch that I highly recommend to anyone looking for unique and effective shaving tools to add to your grooming cabinet. What impressed me with most about Raz*War's razor selection is the fact that they have a Subscription Razor Service. I am rather keen on this idea as I know only too well how hard it can be to find a razor that actually shaves the exact way you want it to. This awesome razor subscription service offers customers a peace of mind without the headache of buying new blades and cartridges. Change your specified cartridges at your own rhythm fuss free. I just love the fact that having your own personal blade designed to cut against your specific skin type reduces the risk of skin irritation, giving you the best possible shave. The best thing about Raz*War's razors is that they seem far more effective than the big powerhouse brands such as Gillette, and yet you can purchase them for much cheaper as well! It's a win-win situation! If you're looking for a great razor then I'd definitely recommend Raz*War's El Fidel 5 Blade Razor for extra comfort and close shave. To purchase this product click here! All-Natural Shaving Oil - A superb natural shaving oil which has the added benefit of being see-through, allowing you to sculpt your goatee/beard with precision and ease. Modern Shaving Soap - With increasing popularity of shaving soaps this soap provides your skin with a soothing effect while your blades glide across your face. Shaving Bowl & Brush - Two fine additions to the Raz*War shaving collection. I've always found shaving bowls and brushes to be extortionately priced on the market, but not in this case. The stainless steel shaving bowl and the shaving brush (with synthetic fibres) are two essential additions to the shaving cabinet, adding a bit of vintage and style to your collection. Am I impressed with Raz*War shaving products and would I go out and buy them? I think my article has answered this question quite sufficiently. 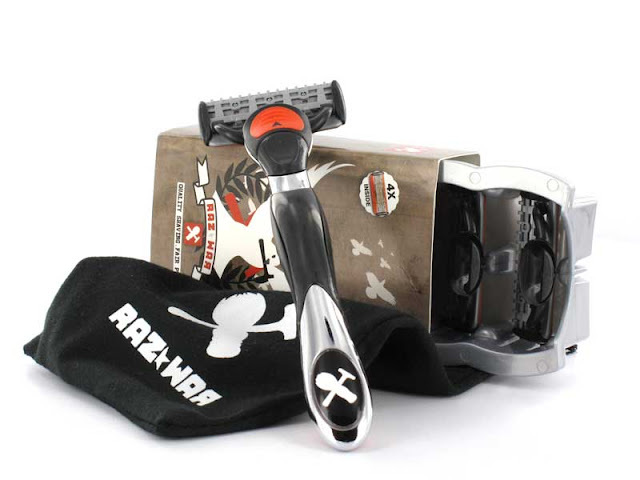 Raz*War offers you a more affordable and more comfortable, closer shave. I am a firm believer in creating products for solutions and that's exactly what Raz*War does - of course it helps that the product range look bloody good!